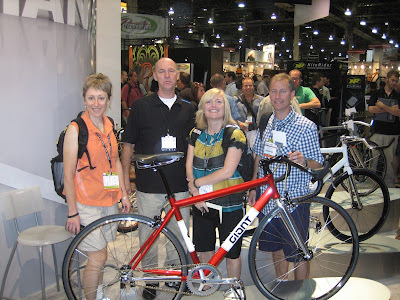 Our first big meeting at Interbike was with Giant and that's a good thing, because we were anxious to see the limited edition Bowery '72 (above and below; $999 SRP), a retro-inspired fixie from Giant's first year on the job. This is one beautiful bike. 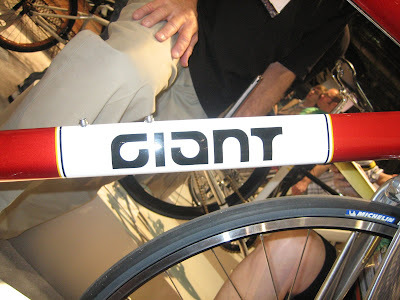 Sporting Giant's original logo (below), it has a custom-bend track style drop bar, a leather saddle with rivets, and track style alloy toe clips with double leather straps. These pictures don't do this bike justice and you gotta see it for yourself -- the one we ordered from the rep as these pictures were taken (and we doubted we might ever see) arrived yesterday. It's already sold, but it's now on display in the Rocky River store and it will make the rounds to the other stores, too, so you can check it out. 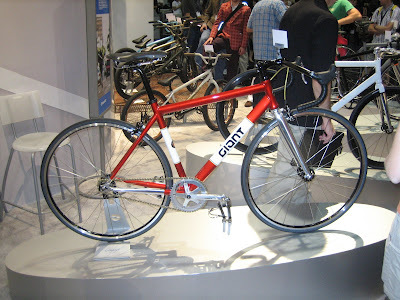 Giant is also making a Bowery '84 (below; $999 SRP), with aero handlebars, from the year the aero ruled the L.A. Olympics. 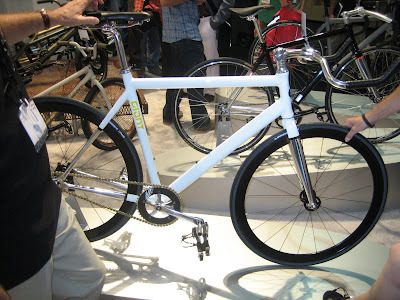 Love for the limited edition bikes aside and just as importantly, in production are the Bowery and the Bowery Mash-Up, both $650 SRP.